Lenovo has a wide range of laptops and desktops for every range of your computing needs. Lenovo offers a value line of laptops and desktops that are affordable but still a solid piece of technology. They also offer high-end systems for the most challenging of computing tasks. Lenovo offers us the online computer eCoupons and deals to pass along to you. The discounts change frequently so check back often to see if there is a deal for you to take advantage of to save you some cash. The Lenovo IdeaPad, Yoga, Flex and ThinkPad are the laptops that Lenovo offers and they come in all shapes and sizes to fit your personal computing needs. The Lenovo IdeaPad Laptops for home or home office are laptops that will satisfy the person needing a solid computer for everyday use or the diehard gamer that needs the more powerful laptop to conquer and destroy. The ThinkPad T Series laptops are built with business owners in mind. Lenovo knows how challenging running a business can be and you do not need the challenges of troubleshooting computer issues to add to the challenge. The ThinkPad delivers speed, security and reliability in laptops to fit your business computing tasks. The Lenovo Tablets come in a variety of flavors to fit your preference. New to the arena are the IdeaPad Tablet and ThinkPad Tablets. The ThinkPad X1 Yoga, the Yoga 700 and the Yoga 900 are a variety of tablets and convertible laptops geared to the fun side of computing with full flash content support for clean Internet browsing, true HD Entertainment and nonstop social networking and business productivity as well. The Lenovo Desktops are a great system for your everyday home computer. They offer different sizes and speeds to fit your personal desires in a PC. Whether you need an entertainment computer to connect to your PC or a small profile computer to fit under your kitchen counter, Lenovo has the desktop computer that will suit your personal computing needs. The ThinkCentre desktops are built for business. Whether you are a four-person business or a global enterprise employing many more employees, your business needs every employee to be as productive and efficient as possible. The ThinkCentre desktops bring quad-core processing power, state-of-the-art security and rock-solid reliability to your business or enterprise. The ThinkCentre desktops are available in a variety of form factors and configurations to meet your business needs so you can achieve your business goals. There are also coupon codes and deals on Lenovo Electronics and Accessories available here. Below are some of the popular sitewide online computer coupon codes and deals that Lenovo is offering at this time. 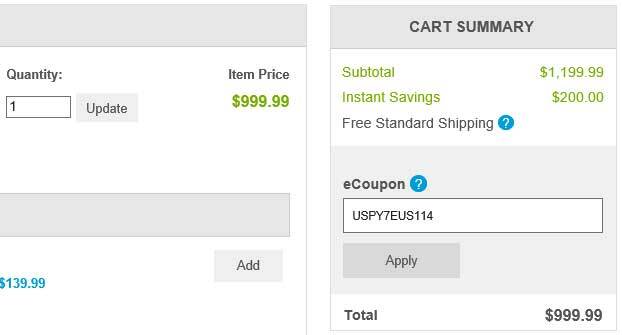 The Lenovo discounts change frequently so check back often. Save up to 39% on select Home laptops at the Lenovo Winter Clearance Sale! Save up to 23% on select Lenovo Desktops at the Lenovo Desktop Sale! The IdeaPad everyday laptop comes in a variety of models to choose from. The most popular being the 300 and 500 series. These are great laptops for the casual computer user needing to browse the web and update statuses on the different social networks. Some are powerful enough to be in a different category so if performance is your thing, these laptops will not disappoint you. Many deals are always offered for these IdeaPad everyday use laptops as well. Lenovo high performance laptops are for the user needing powerful processing power backed up by a good amount of memory and storage space. The graphics capabilities are usually on the higher end of the spectrum for ease of video editing and resource hungry applications. The models are the IdeaPad 510 and 710 and the deals for said models can be found here. The gaming laptops are some of the finest tuned in the industry. They are tried and tested for most of the popular PC games so you can easily blow out your competition with top-notch graphics cards and powerful processors. Gaming is fun, but it is not fun paying full price. That is why we have all the discounts available for the IdeaPad gaming laptops. Lenovo convertible or multimode laptops can be used for everyday use, high performance and even gaming depending on the model you choose. Yoga and Flex are the main laptops in the series. There are usually many eCoupon deals for these 2-in-1 laptops. The ThinkPad series are some of the most powerful office ready laptops available from Lenovo. These laptops have been around for a long time and there is a reason for that. They are a reliable choice for the busy professional that needs to be able to work on-the-go without having to worry about crashes or not having enough computing power while out on the job. There are usually plenty of deals for the ThinkPad T, the ThinkPad P, ThinkPad X and the ThinkPad E series to save your business some money on your IT investment. The IdeaCentre desktops have long been a staple of excellence for the Lenovo desktops. They come in many different form factors to suit any desktop needs. They come in small form factors, big towers and All-in-Ones. These are suitable for a wide range of computing from everyday use to extreme gaming. There are usually eCoupons or instant discounts available for the IdeaCentre desktop. Lenovo carries a wide variety of gaming desktops to suit just about any gamer’s needs. They have the Legion Y720 Cube, the Y700, the Y900 and the extreme Y900 RE or Razer Edition. They range in specifications but all are sure to be able to play the latest games available without lagging behind the competition. The best part of the variety of gaming desktops is the variety of deals offered on these powerful systems. ThinkCentres and ThinkStations are robust workstations mainly used for a business or small office. Reliable and powerful is a great way to explain them. If you are looking for a workplace desktop that can handle the workload, the ThinkCentre or ThinkStation may be a good choice for you. Might as well save some money on your purchase while you are at it. What is a Lenovo eCoupon Code and how do you use it? 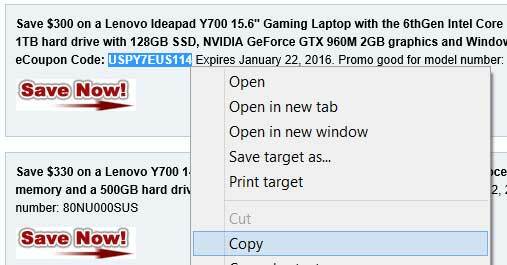 Lenovo almost always have eCoupon codes available to save you money on your purchase. They occasionally have promos in the form of instant savings but their popular method of savings is what they call an eCoupon code and they can save you some big bucks and are easy to use. All you have to do is find the deal you want like the one shown below found on this site. That looks like a good deal so the next step is to copy the code. To do that, highlight it and right-click on it to bring up the copy menu as shown below. Then all you have to do is click the link and configure the PC like you want it and paste the code in the appropriate spot at the Lenovo checkout. Then simply apply the eCoupon and reap your rewards. 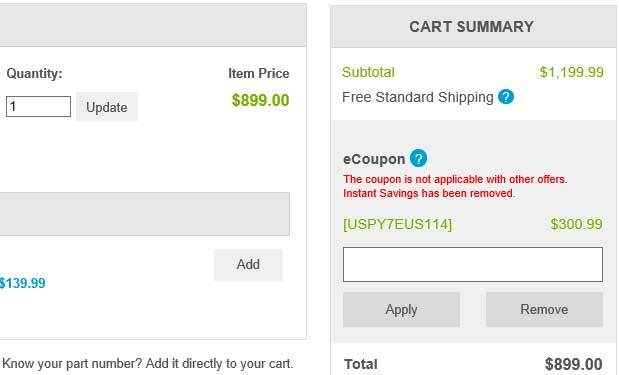 That is quite a savings for just a few clicks. No that you know how to use a Lenovo eCoupon, get out there and save some money.